John Arthur, the Department of Energy’s (DOE) new Yucca Mountain project director, met with Crescent Valley residents on July 8 at the town center. Arthur’s previous job was in New Mexico, as manager of DOE’s transuranic Waste Isolation Pilot Project (WIPP) in New Mexico. The late afternoon meeting drew about 20 Crescent Valley area residents who quizzed Arthur on the Yucca Mountain project and its impacts. Several residents expressed frustration that Arthur, as the latest DOE representative to visit the area, still could not answer questions posed to DOE at the 1999 Draft Environmental Impact Statement hearings. Arthur said until DOE makes decisions on mode (mostly rail or mostly truck) and routes, it is difficult to answer those questions. DOE has not evaluated whether the rail spur itself should be used only for nuclear waste trains or for other commercial uses. How and when those decisions will be made by DOE is still uncertain. Several bills affecting the Yucca Mountain Project and nuclear waste transportation are currently being debated in Congress. Whistleblower Protection law — Nevada Senators Harry Reid and John Ensign added an amendment to an energy bill that strengthens whistleblower protection for Energy Department (DOE) and Nuclear Regulatory Commission (NRC) employees. The two senators were motivated to introduce the legislation after two DOE Yucca Mountain staff who had agreed testify at a hearing about problems in the project backed out at the last minute. Reid and Ensign, who organized the Whistleblower Protection law hearing, feared that the employees had been intimidated by DOE, though the Department denies any wrongdoing. Under current law, only contractors with DOE are covered by whistleblower protection laws. At the NRC, only employees of a licensee of the Commission are covered, but neither NRC employees nor NRC contractors fall under the protection. Reid and Ensign’s new legislation will ensure that all DOE and NRC federal employees and contractors are covered. The amendment has been passed in both the House and the Senate and is expected to be signed into law with the final bill. Water and Energy Appropriations Bill — Also debated in Congress this summer were two different versions of the spending bill that provides funding to DOE for the Yucca Mountain Project. The House’s bill, passed with a 377-26 vote, contains a record $765 million for Yucca in the 2004 fiscal year. President Bush only asked for $591 million, but House leaders felt a larger budget would help the project get back on schedule. The bill includes a provision directing DOE to select a central Nevada rail corridor for waste shipment within sixty days of the bill’s signing, formalize it as the preferred route by June 30, 2005, and have it ready for construction by 2007. The bill instructs DOE to eliminate two rail options that would ship nuclear waste through Clark County. House Republicans also wanted to include a provision providing for early nuclear waste storage at the site, but Nevada Representatives Jim Gibbons and Jon Porter managed to convince House leaders to drop this part of the bill. The House bill additionally includes a $30 million ‘enticement’ sum to Nevada, entitled “local impact assistance,” to mitigate the economic and environmental effects of the nuclear waste repository. Critics, however, say the sum is misleading and inadequate to cover public emergency planning. Defense Authorization Bill Provision: Yucca Secrecy — The Department of Energy (DOE) requested legislation in Congress that would tighten secrecy on the Yucca Mountain Project. House Republicans inserted such a provision into a House defense authorizatio n bill. The provision would increase DOE control over unclassified security-related aspects of nuclear waste storage facilities. Yucca opponents are afraid DOE could use the new authorization to restrict disclosure about nuclear waste transportation routes or about possible aircraft crash threats to the Yucca Mountain facility. The Department maintains that these fears are unwarranted, but Nevada lawmakers remain concerned. In a letter to the House Armed Services Committee leaders, Nevada Reps Berkley, Gibbons, and Porter said the provision “gives the Department of Energy the authority to shut the American public out of the Yucca Mountain Project process.” The provision was passed with the defense bill in the House on May 21. It will go to a conference committee with the Senate sometime this fall. Anti-terrorist Waste Transportation Bill — In July, Nevada Representative Shelly Berkley (D) reintroduced a bill in the House that would require the government to develop an extensive anti-terrorist plan before applying for a license to build and run the Yucca Mountain storage facility. The bill, co-sponsored by Gibbons and Porter, is designed to ensure maximum security of nuclear waste transportation and storage. It would set up many complicated requirements that Berkley hopes would force DOE to delay construction of the repository. Among the requirements: The Dept of Homeland Security would have to initiate counter-terrorist plans on federal, state and local levels. The Federal Emergency Management Agency would be required to prepare a coordinated emergency response strategy. Berkley first introduced the anti-terrorist bill to the House in October 2001, but it was killed in a conference committee. Although this new version is also likely to fail, Berkley intends to provoke discussion about the issue. Nevada’s major Yucca Mountain lawsuits were set to to federal court this fall, but now they may not be heard until sometime in 2004. In August, the U.S. Court Appeals in Washington, D.C. moved the consolidated cases to its 'complex' calendar and postponed the previous October 3rd court date. The new ‘complex’ designation reflects the complicated nature of the combined cases. It also means the State of Nevada will have several hours argue its case instead of the standard 15 minutes. 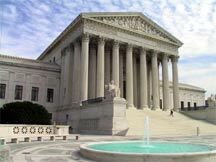 Oral arguments will be heard by a 3-judge panel of the D.C. Court of Appeals. The procedure will be open to the public. The suits, filed over the past two years, argue that several agencies, including the Department of Energy, the Environmental Protection Agency, and the Nuclear Regulatory Commission violated the law throughout the Yucca Mountain site characterization and recommendation process. The state asks the court to declare President Bush’s designation of Yucca Mountain invalid. The state also asks that construction of the repository be barred pending the outcome of the cases. Last November, the D.C. Court agreed to hear all the major cases together. This will allow the 3-judge panel to get the full picture, hearing all of Nevada's major cases in a relatively short period of time, rather than splitting up the suits between panels or having the cases spread out over months. Then, in January 2003, Nevada filed another major lawsuit against the Yucca Mountain Project. The suit is a constitutional challenge against the federal government. It argues that by forcing the state to house nuclear waste against its will, the federal government is violating the State of Nevada's sovereign rights. In March, the federal court in D.C. decided the case would be heard with the others. The court hearings are expected to take place sometime in late 2003 or 2004. Once they have concluded, the judges will most likely take several months to make a decision. The decision could be multifaceted and could include the remanding or striking of actions. For example, the judges could order the DOE to re-do parts of the Yucca Mountain Environmental Impact Statement. Both sides are expected to appeal to the Supreme Court. New Additions to Eureka County’s Yucca Mountain Website! Licensing – we’ve created a new center all about the Yucca Mountain Licensing Process, including information about Nuclear Regulatory Commission license criteria, public participation in the process, and the licensing schedule. Click on the license button on the homepage to find out more. Archives – we’ve put together an archives center of all of the older information on yuccamountain.org. Click on the archives button for easier access to less recent news, newsletters, legislation & litigation info. Transportation – we’ve updated our nuclear waste transportation page with new transportation-related news, links, and current information about the Price- Anderson Act. Litigation – the lawsuits center has been updated to reflect all current case information, news articles, and downloadable briefs filed by the Nevada legal team against the Yucca Mountain repository. Other – additional pages with updated information include: the calendar page, the contact page, the timeline page, and, as always, the what’s new page. Quality Assurance, or QA, is a system of management controls that requires employees to follow national nuclear safety standards. The U.S. Department of Energy (DOE) QA program has a system used to track and verify the quality of data collected at Yucca Mountain. DOE’s QA Program plays a critical role in the Yucca Mountain licensing process, as it will be used to prove to the Nuclear Regulatory Commission (NRC) that the underground repository will function properly and meet all health and safety standards. The QA program is directed through the DOE’s Office of Civilian Radioactive Waste Management, Office of Quality Assurance, but all Yucca Mountain employees are responsible for implementing the QA program, maintaining self-assessment, and reporting any problems. DOE recognizes the necessity of a good Quality Assurance Program and is committed to public safety, environmental protection, and meeting licensing regulations. Denny Brown, Director of the Office of Quality Assurance, says he is confident that DOE is meeting the intent of the Quality Assurance requirements. However, the QA program has been problematic “since day one,” says Susan Lynch, administrator of technical programs for the Nevada Agency for Nuclear Projects. In the beginning, work at Yucca Mountain was not completed according to QA procedures, resulting in a large amount of unusable data and millions of dollars wasted. There have been complaints that DOE is cutting QA corners in its rush to submit a license application by December 2004, according to recent news reports. Several workers have come forward saying that employees are discouraged from bringing QA problems to light. Last spring a QA auditing team at Navarro Research, a DOE contractor, reported multiple QA problems in the repository program. Two of the four-member audit team were subsequently reassigned. Such actions, along with many anonymous complaints from workers, prompted Nevada Senators Reid and Ensign to hold a Quality Assurance hearing last May in Las Vegas. 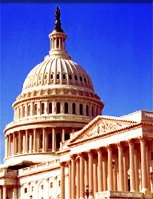 According to news reports, two key witnesses, DOE Yucca Mountain staff, decided at the last minute not to testify, which motivated the Senators to introduce whistleblower protection legislation in Congress. DOE itself admits that there are problems with its QA program. When Margaret Chu took over as Director of the Office of Civilian Radioactive Waste Management a year and a half ago, she recognized that many QA procedures were ineffective and that the system was suffering. In a “Management Improvement Initiatives” document issued in 2002, she outlined Quality Assurance as one of the five key areas needing improvement within the project. She said QA regulations were “confusing and difficult” to follow. The NRC is also concerned about Yucca Mountain Quality Assurance. Commission’s staff has been holding quarterly QA meetings with DOE for more than a decade in order to keep tabs on their progress and suggest QA improvements. In past meetings, NRC officials have criticized DOE for trying to use unqualified data to resolve a Yucca Mountain key technical issue. They also highlighted DOE’s difficulty in stopping problems from reoccurring once they were supposedly corrected. These concerns are shared by the State of Nevada. Officials are worried that DOE is sacrificing Quality Assurance to cut costs and keep to schedule. “ DOE’s attitude seems to be, ‘just trust us’,” said Lynch of the Agency for Nuclear Projects. But Lynch noted that DOE has never done anything to earn that trust. “DOE always says it will fix everything, but it hasn’t yet,” she said. But Brown is very confident about the repository’s future performance. He said that from a technical standpoint, so far Yucca Mountain models and data are valid, despite any QA problems. The extent to which Quality Assurance remains a priority for DOE could depend on NRC’s continued scrutiny before and during licensing. While Brown maintains that “nothing gets by the NRC ,” Lynch and other Nevada officials remain dubious. Brown, however, is optimistic that all significant Quality Assurance problems will be solved by the December 2004 deadline. If not, he said he would recommend that the license application be postponed. 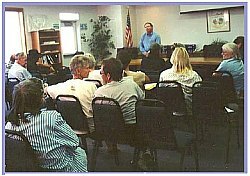 The National Academy of Sciences (NAS) held a hearing about nuclear waste transportation in Las Vegas on July 25, 2003. A 13-member Committee on Transportation of Radioacaive Waste listened to presentations from Energy Department officials, representatives of Nevada state and local government, transportation experts, activist groups, and concerned residents. The hearing was part of a two-year independent study being conducted by the NAS on how to safely transport high level radioactive waste to Yucca Mountain. This was the second of seven planned meetings on the subject. The panel expects to issue a report on the subject in early 2005. To the dismay of many, a Department of Energy (DOE) official announced at the hearing that waste transportation routes and methods would not be revealed until 2006. Jeff Williams, acting manager of the DOE Transportation Program, said a strategic transportation plan was scheduled for release at the end of September, but that shipping routes and truck versus train decisions would be significantly delayed. Nevada officials were troubled and angered by the news. “What it means is they are holding 13 (Nevada) counties hostage,” said Nevada transportation advisor Robert Halstead, as reported in the Las Vegas Sun. “I am astounded that they are not ready to make a decision.” “No one can do any planning until they know the mode and the route,” insisted Bob Loux, head of Nevada’s Nuclear Waste Projects Office, according to the Las Vegas Review-Journal. Other participants in the hearing included transportation experts, a nuclear physicist, a terrorist expert, and concerned Nevada residents. Affected Units of Local Government representatives, including Eureka County, participated in a panel discussion. Clark County explained the effects of transportation on property values. Nye County and Lincoln County each described their efforts to plan for transportation impacts without a schedule from DOE. Eureka County presented the concerns of five northern counties regarding rail and highway transportation impacts such as emergency response, land use, private land, water resources, and grazing. Nevada Representative Jon Porter, who was unable to attend the hearing, sent a letter to the panel instead. “Do you really want to further the interests of terrorists with mobile nuclear weapons?” he asked, writing about possible terrorist attacks on shipments. The hearing lasted for eight hours, but no decisions were made at its conclusion. Panel Chairman Neal F. Lane told the Review-Journal that the panel’s job is to “understand and articulate what the risks are of transporting nuclear waste.” He and other panel members visited the Yucca Mountain site and toured rail and highway routes in Southern Nevada before holding the hearing. The National Academy of Sciences is a private, nonprofit society of prominent scientists and engineers. The society was founded by Congress in 1863 to advise the government on scientific and technical matters. State Engineer holds hearings on Yucca Mountain water rights — On August 22 and 23, Nevada State Engineer Hugh Ricci held a hearing about the Department of Energy’s request for a permanent water permit at Yucca Mountain. The Energy Department (DOE) wants to withdraw 430 acre-feet of water from a Nye County basin each year for construction and operation of the nuclear waste repository. The State of Nevada contends that such use of underground water would cause environmental damage to the State. Senior Deputy Attorney General Marta Adams said that Nye County water used at Yucca Mountain would lead to contamination of the underground water supply. DOE lawyer Brent Kolvet said those arguments had already been rejected by a federal court. He said DOE’s water permit application meets all State law requirements. Engineer Ricci said he would rule on the matter later at an unspecified date. Former State Engineer Mike Turnipseed denied DOE’s application once, but the decision was overturned by the 9th circuit court of appeals. The court ordered more hearings on the subject. Panel finds Skull Valley site could withstand earthquake — Although the panel ultimately ruled against granting PFS a license last March, the Atomic Safety and Licensing Board did find that the Skull Valley storage site would be able to adequately sustain an earthquake. The state of Utah had raised several seismicrelated concerns about the subsurface soils at the site and had asked questions about the stability of the casks during an earthquake. The site, about 50 miles southwest of Salt Lake City, is located between four fault lines. But Nevada officials believe GAO underestimated the risks — The State of Nevada and watchdog groups say the GAO’s research was too limited and ignored important studies about terrorism. They point out that the GAO only examined Energy Department and Nuclear Regulatory Commission contractor reports, and did not look at research on terrorist target selection, or examine any of the State of Nevada’s research. Waste from Nevada Test Site may be shipped through Eastern Nevada — DOE is considering a proposal to ship transuranic nuclear waste across rural Nevada after California opposed use of one of its southern roadways. In July, California officials protested a DOE plan to ship the waste to the Waste Isolation Pilot Plant WIPP) in New Mexico through southern California. The 1,130-mile route would avoid Las Vegas by shipping waste-bearing drums 90 miles on California Route 127 through Death Valley. Western governors have reached a compromise by proposing that the waste be shipped to WIPP via rural Nevada after 2005. The 1,800-mile alternate route would take waste along two-lane highways through Tonopah, Ely and Wendover. The waste would go through Salt Lake City in Utah, swing up through Wyoming, and pass down through Colorado on its way to New Mexico (see map). About 55 shipments would be made through California until December 31, 2004, and then the remaining 55 shipments would go through Nevada in 2005. Nevada Agency for Nuclear Projects Director Bob Loux said the state has yet to take a position on the proposal, but he said it might be acceptable. “I suspect it would not be objectionable primarily because we're doing low-level (nuclear waste) shipments on those routes generally,” Loux said. The waste includes laboratory clothing, tools, plastics and other solids contaminated with plutonium, neptunium and other radioactive material produced in nuclear weapons research and production. The Eureka County Nuclear Waste Update is published by the Eureka County Yucca Mountain Information Office, P.O. Box 714, Eureka, NV 89316, (775) 237- 5372. The purpose of the Update is to provide information to the public about issues related to the proposed nuclear waste repository at Yucca Mountain. The newsletter is funded by a grant to Eureka County from the U.S. Department of Energy.